Tomatoville® Gardening Forums Index > We're Here For The Tomatoes!™ > Growing for Market > Cold Frame...Portable Greenhouse for seedlings. This is actually a GREAT deal, this size is selling for double this price elsewhere! Last edited by rhines81; January 8, 2017 at 06:43 PM. Thanks to both of your for pointing out the shelf problem. Rajun, I looked at the one you linked and while I really like the price, I'm skeptical about that cover. What do you think of this one? It doesn't come with shelving, I can improvise that pretty easily, but the venting system looks like a great feature. I had to really laugh at this "use" that they highlighted ... "Doubles as a portable shed or a get away sun room for relaxation purposes" ... HA!!! Who would go into a 5x7' tent to relax? Dak, this is OK for some purposes and it is economical, but I would really doubt that it would hold up to a foot of snow or any good wind storms. It might get by in south Texas for a Dec - Feb chill, but not sure it would hold up to a late March noreaster in New England/Mid Atlantic. I bought a bigger green house with that cover and it lasted 2 seasons but it was in the sun all year, I think you're gonna have the same problem with the one you posted and for that price you can get a bigger one. I'm warning you now, green houses are as addicting as growing tomatoes, once you get one, you'll want a bigger one. You can always replace the plastic as needed about every 4 years is normal even with good green house plastic. I have to agree that bigger is better, but the 'cheap' pup-tent type hoop houses just will not hold up to the wind with their coat hanger type frames and light weight. 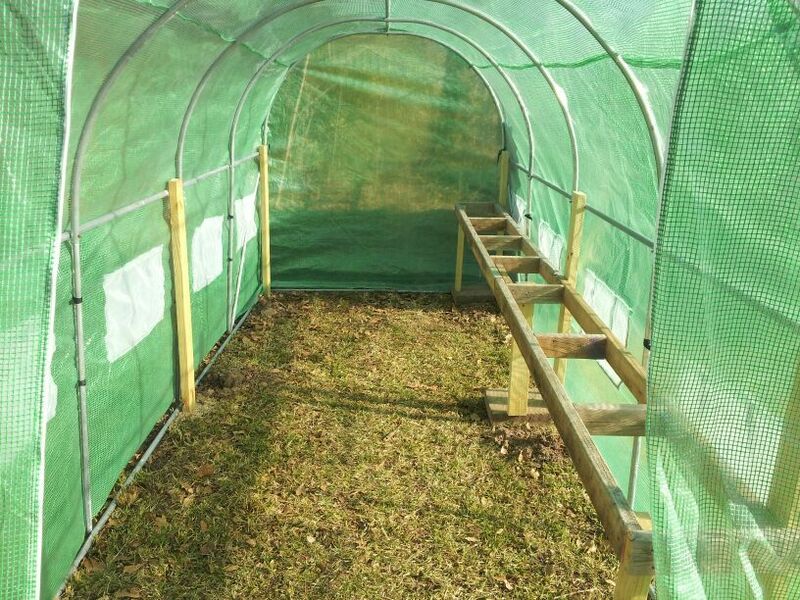 Need wood and HD Plastic or acrylic walls with a heavier frame, or we are talking about a yearly disposable greenhouse which could end up trashed by mother nature even before one season ends. Dak is in Central Coast Cali, I don't think a snow load is an issue. What do you mean it's not relaxing to get sun, I love the fact that when it's 40 and windy, the GH is toasty. That's usually where I drink my first cup of coffee. You can reinforce them, I even cemented 2x4's and screwed the frame to the post, 3 years and still going. Disclaimer: It hasn't been through a hurricane yet. Edited to add: The frame is 3/4"EMT, all it needs is a few more purlins. Last edited by Rajun Gardener; January 8, 2017 at 07:27 PM. Well, I don't think my body would appreciate the vitamin D from the Sun in a 5x7 Green pup tent. Warm and toasty, maybe, but hardly a relaxing area considering that plants would take up most of that room as well ... walk-in, water, leave .... no relaxing in that small space! Rajun Gardener is right, no snow here. The months that I plan to use it, Feb - May may be cold, but usually not fraught with bad winds. While I am not handy with construction, I do have a husband and son that are that I plan to enlist to set up and bolt her down. The ebay offerings also, all come from China. When I can, I prefer to support US businesses. I really do appreciate you all steering me away from a bad purchase, there is a wealth of experience here, thanks for all your comments. Looks a little like jmsieglaff 's set up. This worked well for me. If hail is forecast I cover the top with styrofoam and tie it down with tent stakes. It is a process. I really like the protection from wind on the babies. I've put up the soft sided too, but on the deck where it is protected and shaded . It needs reinforcing in my climate. As I mentioned above, I use styrofoam on the ground to keep the cold soil from cooling the trays down. Last edited by greenthumbomaha; January 8, 2017 at 09:22 PM. Farmette, do you insulate the bottom or keep the "natural" floor. I used styro in mine and it helped keep the temp a few degrees warmer. Maybe the sun hitting the ground compensates for the cold being radiated form the earth. Lisa: I have a wood deck off my patio doors and I set up my portable greenhouse right on the wood. You have my situation almost exactly (here in Indiana 5b). But I've got perhaps a bit more room. I start my plants in my wife's sewing room where we have a home made plant stand that I built 40+ years ago. I get one shelf; she gets three. But... I move the plants into the attached garage in March. I have a south-facing window + T8 lights on pulleys that I can raise and lower easily. Then about April 15th, the plants go to the cold frame -- a Juwel that I got at Amazon several years ago. Not cheap, but very well built and should last my lifetime and then some. Normally, I can get by with using several gallon jugs of hot water at night on very cold evenings. I get my first Red Robin cherry tomatoes in May, so this system works well for me. It includes the automatic opener/closer, and that makes things a lot easier to manage. Costco online is having a very short lived sale (it ends today) of the cold frame above. It is very sturdy compared to the lower cost model from this company. Cost is $229 plus whatever your state tax is.